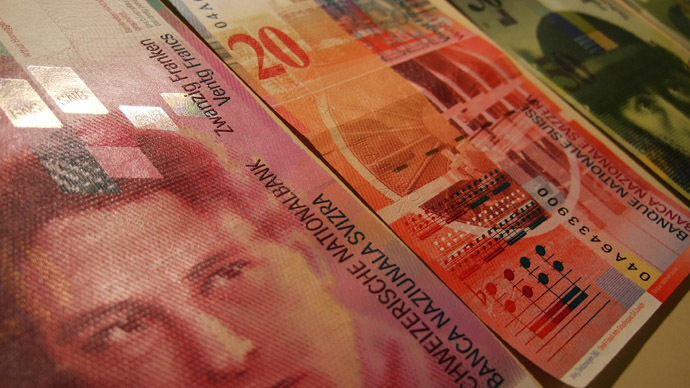 The Swiss franc has added more than 15 percent against the euro after the Swiss National Bank dropped a three-year old limit that capped the currency's value at 1.2 against the euro. The bank said in a statement that the cap, introduced in September 2011,“protected the Swiss economy from serious harm,”but isn’t necessary any longer. The move comes a week before the first 2015 European Central Bank meeting in Frankfurt where it could announce a massive stimulus package that could further devalue the euro. The franc climbed to 96 centimes per euro at 11:30 GMT, according to Bloomberg, after reaching 85.17 centimes, the strongest level on record, as the Swiss National Bank removed the 1.20 per euro limit in force since September 2011. On Wednesday, a European Court of Justice advocate general, Pedro Cruz Villalon said the ECB could legally buy huge amounts of eurozone debt to stabilize the economy. The opinion isn’t legally binding on the court but the judges usually follow the advocate’s general opinion. If adopted, the ruling would pave the way for ‘quantitative easing’ in Europe, which would immediately devalue the euro against other currencies. Thursday’s decision by the SNB shook world markets. The yield on 10-year US Treasuries (USGG10YR) fell 0.05 percentage points, and the yields on German two-year notes dropped to a record minus 0.154 percent. The price of Euribor futures rose above 100 for the first time in months, turning implied yields negative. The Swiss Market Index (SMI) for equities dropped 9 percent seeing its biggest decline since 2008, and Swatch Group AG; Switzerland’s biggest watchmaker saw its share price slump 15 percent. Gold in turn surged to a 4-month high, with spot prices rising as much as 2.4 percent to its highest level since September at $1,260.30 an ounce. US gold futures for delivery in February rose 1.4 percent to $1,252.30 an ounce. "Gold is gaining from a risk-off situation because nobody expected the Swiss central bank not to keep that cap, and this has created potential big losses in many places and is obviously triggering some flight to safety," Saxo Bank senior manager Ole Hansen told Reuters.